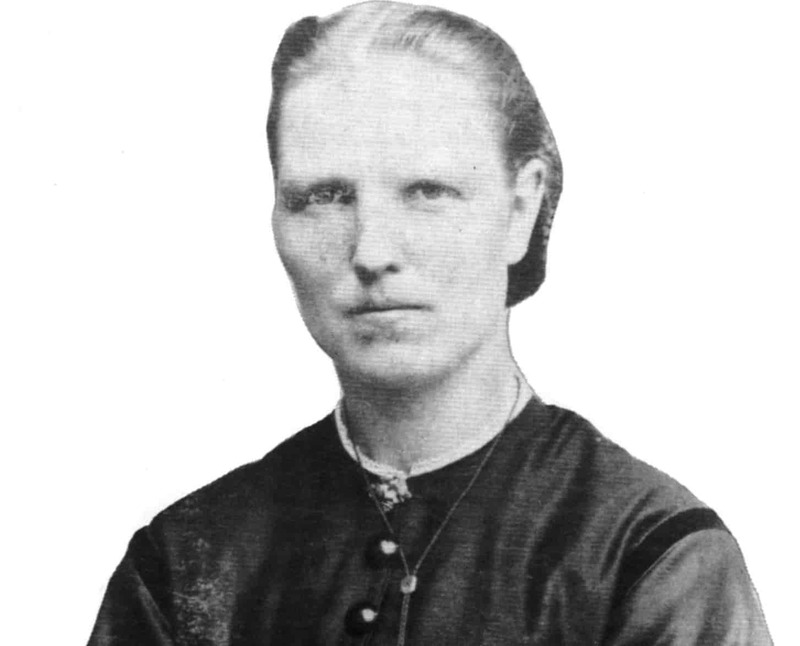 Anne Olsdotter Kvålen was born in Skåbu on 6 January 1846. Her father, Ola Kvålen, and her mother, Kari, were both from Fron in the Gudbrandsdal valley. Ola and Kari Kvålen bought Solbrå farm from the Norwegian state in 1850. By the standards of the day, Solbrå was a large, fine farm. The agricultural census for 1865 recorded the farm as having four horses, 27 dairy cattle, seven sheep and five pigs, as well as seven smallholders and a mountain farm for summer dairying. The farm produced mostly butter, which was easy to sell and provided the farmers with cash. It was at Solbrå that Anne grew up. She was confirmed in Sør-Fron Church on 9 June 1861. Anne was first among the girls to be confirmed that day (having got the best marks), with top marks in religious instruction and diligence. In other words, Anne was talented and well-behaved. From her earliest childhood, Anne would help with the chores at home and in summer look after the cows on the mountain farm. It was quite usual in those days for children to help with work on the farm. Anne was an enterprising, hard-working and thoughtful child. The summer she was confirmed (at the age of 16), she was made responsible for running Solbrå’s mountain farm, situated with a cluster of other mountain dairy farms on the slopes of the beautiful Gudbrandsdalen. From then on, she was in charge of the mountain farm every summer. The work involved treating and preserving the milk, churning butter, making cheese and boiling the whey. Anne’s father disliked goats (which he thought were a nuisance), so Anne only had cows’ milk on the farm. In the light summer evenings, the dairymaids visited one another, when they had time to spare, and exchanged experiences. Young lads from the local villages would also come up to the mountain farms as often as they could – so love and romance occured often. Anne married farmer Tor Hov in Sør-Fron Church on 7 September 1868. She was 22 years old and Tor was 23. They bought Rusthage farm in Gudbrandsdal in the spring of 1868 for 3,000 speciedaler. One summer evening in 1863, Anne was visiting the neighbouring mountain farm. Here she was given some brown cheese to eat made from the whey of cows’ milk. It had a deep, full-bodied flavour which Anne liked very much. She got permission from her father to try to make a similar cheese on their own farm. Anne decided to pour cream into the whey that she was boiling to make the cheese. When the mass had cooked down to the right rich consistency over several hours, she scooped it into a trough. She then stirred the mass until it was cold and kneaded it with her hands, before placing it into cheese moulds. The new variant she had created (with added cream) was well received and everyone thought it tasted good. Anne’s first Gudbrandsdalen cheese is known to have been created in the summer of 1863. There was widespread poverty in Norway in 1870-80. Conditions were so bad that today we are barely capable of imagining how hard life was for many people. The farmers of Gudbrandsdalen strove to make ends meet. In order to get better paid for their milk, 12 farmers joined together and started a dairy cooperative in December 1877. Anne did not want to deliver milk to the dairy in Ruste, because it was so far away. And so she started making cheese at home. This time, she added both cream and goat’s milk. Anne’s “cheese factory” was pretty simple and basic. Working in her own kitchen, she boiled the whey in a 70-litre kettle over the fire. She then sold the cheese in the nearby village. The local shopkeeper found there was great demand for Anne’s flavour some cheese, first in the local areas in the Gudbrandsdal valley and subsequently in the whole of Norway. Anne Hov can bear the title as inventor of the iconic Gudbrandsdalen cheese. She was awarded The King’s Medal of Merit by the Norwegian government, in her home in Gudbrandsdalen in January 1933. Anne was thanked for her efforts in having helped save Gudbrandsdalen from financial ruin in the 1880s, precisely for developing the cheese which has subsequently become Norway’s national cheese. Text and image of Anne Hov from the book “Gudbrandsdalsosten 125 år” by Jens Sundt.